THE THIRTY YEARS’ WAR (1618-1648). The Thirty Years’ War, of which Gustavus Adolphus was the greatest hero, was the result of those religious agitations which the ideas of Luther produced. It was the struggle to secure religious liberty,–a warfare between Catholic and Protestant Germany. It differed from the Huguenot contest in this,–that the Protestants of France took up arms against their king to extort religious privileges; whereas the Protestants of Germany were marshalled by independent princes against other independent princes of a different religion, who sought to suppress Protestantism. In this warfare between Catholic and Protestant States, there were great political entanglements and issues that affected the balance of power in Europe. Hence the Thirty Years’ War was political as well as religious. It was not purely a religious war like the crusades, although religious ideas gave rise to it. Nor was it an insurrection of the people against their rulers to secure religious rights, so much as a contest between Catholic and Protestant princes to secure the recognition of their religious opinions in their respective States. The Emperor of Germany in the time of Luther was Charles V.,–the most powerful potentate of Europe, and, moreover, a bigoted Catholic. On his abdication,–one of the most extraordinary events in history,–the German dominions were given to his brother Ferdinand; Spain and the Low Countries were bestowed on his son Philip. Ferdinand had already been elected King of the Romans. There was a close alliance between these princes of the House of Austria to suppress Protestantism in Europe. The new Austrian emperor was not, indeed, so formidable as his father had been, but was still one of the greatest monarchs of Europe; and so powerful was the House of Austria that it excited the jealousy of the other European powers. It was to prevent the dangerous ascendency of Austria that Henry IV. of France raised a great army with a view of invading Germany, but was assassinated before he could carry his scheme into execution. He had armed France to secure what is called the “balance of power;” and it was with the view of securing this balance of power that Cardinal Richelieu, though a prince of the Church, took the side of the Protestants in the Thirty Years’ War. This famous contest may therefore be regarded as a civil war, dividing the German nations; as a religious war, to establish freedom of belief; and as a war to prevent the ascendency of Austria, in which a great part of Europe was involved. The beginning of the contest, however, was the result of religious agitation. The ideas of Luther created universal discussion. Discussion led to animosities. All Germany was in a ferment; and the agitation was not confined to those States which accepted the Reformation, but to Catholic States also. The Catholic princes resolved to crush the Reformation, first in their own dominions, and afterwards in the other States of Germany. Hence, a bloody persecution of the Protestants took place in all Catholic States. Their sufferings were unendurable. For a while they submitted to the cruel lash, but at last they resolved to defend the right of worshipping God according to their consciences. They armed themselves, for death seemed preferable to religious despotism. For more than fifty years after the death of Luther, Germany was the scene of commotions ending in a fiery persecution. At that time Germany was in advance of the rest of Europe in wealth and intelligence; the Protestants especially were kindled to an enthusiasm, pertaining to theological questions, which we in these times can but feebly realize; and the Germans were doubtless the most earnest and religious people in Europe. In those days there was neither religious indifference nor scepticism nor rationalism. The faith of the people was simple, and they were resolved to maintain it at any cost. But there were religious parties and asperities, even among the Protestants. The Lutherans would not unite with the Calvinists, and the Calvinists would not accede to the demands of the Lutherans. After a series of struggles with the Catholics, the Lutherans succeeded, by the treaty of Augsburg (1555), in securing toleration; and this toleration lasted during the reigns of Ferdinand I. and Maximilian II. Indeed, Germany enjoyed tranquillity until the reign of Matthias, in 1612. This usurping emperor, who had delivered Germany from the Turks, abolished in his dominions the Protestant religion, so far as edicts and persecution could deprive the Protestants of their religious liberties. Matthias died in 1619, and was succeeded by Ferdinand II., a bigoted prince, who had been educated by the Jesuits. This emperor was an inveterate enemy of the Protestants. He forbade their meetings, deprived them even of civil privileges, pulled down their churches and schools, erected scaffolds in every village, appointed only Catholic magistrates, and inflicted unsparing cruelties on all who seceded from the Catholic church. It was under this Austrian emperor, seventy-three years from the death of Luther, that the first act of the bloody tragedy which I am to describe was opened by an insurrection in Bohemia, one of the hereditary possessions of the House of Austria. In this kingdom, isolated from the rest of Germany, separated on every side from adjoining States by high mountains of volcanic origin, peopled with the descendants of the ancient Sclavonians, who were characterized by impulse and impetuosity, the reformed doctrines had taken a powerful hold of the affections and convictions of the people. The followers of John Huss and Jerome of Prague were something like the Lollards of England, in their spirit and sincerity. But they were persecuted by their Catholic rulers with a rigor and cruelty never seen among the Lollards; for Ferdinand II. was the hereditary king of Bohemia as well as emperor of Germany. At last his tyranny and cruelties became unendurable, and in a violent burst of passionate indignation his deputies were thrown out of the windows of the chamber of the Council of Regency at Prague. This act of violence was the signal of a general revolt, not in Bohemia merely, but in Silesia, Moravia, Hungary, and Austria. The celebrated Count Mansfeld, a soldier of fortune, with only four thousand troops, dared to defy the whole imperial power; and for a while he was successful. The Bohemians renounced their allegiance to Ferdinand, and chose for their king Frederick V.,–Elector Palatine of the Rhine, son-in-law of James I. of England, and head of the Protestant party in Germany. He unwisely abandoned his electoral palace at Heidelberg, to grasp the royal sceptre at Prague. But he was no match for the Austrian emperor, who, summoning from every quarter the allies and adherents of imperial power, and making peace with other enemies, poured into Bohemia such overwhelming forces under Maximilian, Duke of Bavaria, that his authority was established more firmly than before. The battle of Prague (1620) decided the fate of Bohemia, and the Elector Palatine became a fugitive, and his possessions were given to the Duke of Bavaria. Then followed a persecution which has had no parallel since the slaughter of the Albigenses and the massacre of St. Bartholomew. The unhappy kingdom of Bohemia was abandoned to inquisitions and executions; all liberties were suppressed, the nobles were decimated, ministers and teachers were burned or beheaded, and Protestants of every rank, age, and condition were prohibited from acting as guardians to children, or making wills, or contracting marriages with Catholics, or holding any office of trust and emolument. They were outlawed as felons, and disfranchised as infidels. The halls of justice were deserted, the Muses accompanied the learned in their melancholy flight, and all that remained of Bohemian gallantry and heroism forsook the land. Strange to say, the land of Huss and Jerome became henceforth the strongest hold of Austrian despotism and papal superstition. This is one of those instances where persecution proved successful. It is a hackneyed saying that “the blood of martyrs is the seed of the Church;” and it is true that lofty virtues have been generally developed by self-sacrifice and martyrdom, and that only through great tribulation have permanent blessings been secured. The Hollanders, by inundating their fields and fighting literally to the “last ditch,” preserved their liberties and secured ultimate prosperity. The fires of Smithfield did not destroy the reformed religion in England in the time of Mary, and the jails and judicial murders of later and better times did not prevent the progress of popular rights, or the extension of Puritanism in the wilds of the American continent. But in the history of society the instances are unfortunately numerous when bigotry and despotism have kindled their infernal fires and erected their bloody scaffolds, not to purify the Church and nourish the principles of Christian progress, but to destroy what is good as well as what is evil. What availed the struggles of the Waldenses in the Middle Ages? Who came to the rescue of Savonarola when he attempted to reform the lives of degenerate Florentines? What beneficial effects resulted ultimately from the Inquisition in Spain? How was the revocation of the edict of Nantes overruled for the good of the Huguenots of France? And yet the unfortunate suppression of religious liberty in Bohemia, and the sufferings of those who came to her rescue, especially the misfortunes of the Elector Palatine, arrayed the Protestant princes of Germany against the Emperor, and created general indignation throughout Europe. Austria became more than ever a hated and dreaded power, not merely to the States of Sweden, Denmark, Holland, and England, but to Catholic France herself, then ruled by that able and ambitious statesman Cardinal Richelieu, before whose tomb in an after age the czar Peter bowed in earnest homage from the recollection and admiration of his transcendent labors in behalf of absolutism. Even Richelieu, a prince of the Church and the persecutor of the Huguenots, was alarmed at the encroachments of Austria, and intrigued with Protestant princes to undermine her dangerous ascendency. 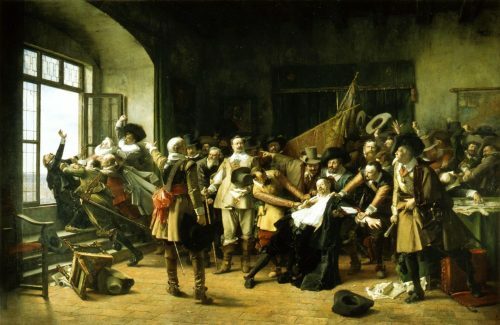 Then opened the second act of the bloody drama of the seventeenth century, when the allied Protestant princes of Germany, assisted by the English and the Dutch, rallied under the leadership of Christian, King of Denmark, and resolved to recover what they had lost; while Bethlen Gabor, a Transylvanian prince, at the head of an army of robbers, invaded Hungary and Austria. The Emperor, straitened in his finances, was in no condition to meet this powerful confederacy, although the illustrious Tilly was the commander of his forces. But the demon of despotism, who never sleeps, raised up to his assistance a great military genius. This was Wallenstein, Duke of Friedland, the richest noble in Bohemia. The person whom he most resembled, in that age of struggle and contending forces, when despotism sought unscrupulous agents, was Thomas Wentworth, Earl of Strafford,–the right hand of Charles I., in his warfare against the liberties of England. Like Stratford, he was an apostate from the principles in which he had been educated; like him, he had arisen from a comparatively humble station; like him, his talents were as commanding as his ambition,–devoted first to his own exaltation; and, secondly, to the cause of absolutism, with which he sympathized with all the intensity that a proud and domineering spirit may be supposed to feel for the struggles of inexperienced democracy. Like the English statesman, the German general was a Jesuit in the use of tools, jealous of his authority, liberal in his rewards, and fearful in his vengeance. Though greedy of admiration and fond of display, he surrounded himself with mystery and gloom. Like Strafford, he was commanding in his person, dignified, reserved, and sullen; with an eye piercing and melancholy, a brow lowering with thought and care, and a lip compressed into determination and twisted into a smile of ironical disdain. This nobleman had fought with distinction as a colonel at the battle of Prague, when Bohemian liberties had been prostrated, and had signally distinguished himself in his infamous crusade against his own countrymen. He offered, at his own expense, to raise and equip an army of fifty thousand men in the service of the Emperor; but demanded as a condition, that he should have the appointment of all his officers, and the privilege of enriching himself and army from the spoils and confiscations of conquered territories. These terms were extraordinary and humiliating to an absolute sovereign, yet, at the crisis in which Ferdinand was placed, they were too tempting to be refused. Wallenstein fulfilled his promises, and raised in an incredibly short time an immense army, composed of outlaws and robbers and adventurers from all nations. He advanced rapidly against the allied Protestant forces, levying enormous contributions wherever he appeared; as imperious to friends as to foes, mistrusted and feared by both, yet supremely indifferent to praise or censure; resting on the power of brute force and his ability to enrich his soldiers. Possessing a fine military genius, unbounded means, and unscrupulous rapacity, and assisted by such generals as Tilly, Pappenheim, and Piccolomini, seconded by Maximilian, Duke of Bavaria, he soon reduced his enemies to despair. The King of Denmark was unequal to the contest, and sued for peace. The Elector Frederic again became a fugitive, the Duke of Brunswick was killed, and the intrepid Mansfeld died. The Electors of Saxony and Brandenburg, the natural defenders of Protestantism and the leading princes of the league, were awed into an abject neutrality. The old protectors of Lutheranism were timid and despairing. The monarchs of Europe trembled. Germany lay prostrate and bleeding. Christendom stood aghast at the greatness of the calamities which afflicted Germany and threatened neighboring nations. But the Emperor at Vienna was overjoyed, and swelled with arrogance and triumph. He divided among the members of his imperial house the rich benefices of the Church, and bestowed upon his victorious general the revenues of provinces. He now resolved to pursue the King of Denmark into his remotest territories, to dethrone the King of Sweden, to give away the crown of Poland, to aid the Spaniards in the recovery of the United Provinces, to exterminate the Protestant religion, to subvert the liberties of the German nations, and reign as a terrible incarnation of imperial tyranny. He would even revive the dreams of Charlemagne and Charles V., and make Vienna the centre of that power which once emanated from Borne. He would ally himself more strongly with the Pope, and extend the double tyranny of priests and kings over the whole continent of Europe. Fines, imprisonments, tortures, banishments, and executions were now added to the desolations which one hundred and fifty thousand soldiers inflicted on villages and cities that had been for generations increasing in wealth and prosperity. In that dark hour of calamity and fears, Providence raised up a greater hero than Wallenstein, a noble protector and intrepid deliverer, even Gustavus Adolphus, King of Sweden; and the third act of the political tragedy opens with his brilliant career. Carlyle has somewhere said: “Is not every genius an impossibility until he appear?” This is singularly true of Gustavus Adolphus. It was the last thing for contemporaries to conjecture that the deliverer of Germany, and the great hero of the Thirty Years’ War, would have arisen in the ice-bound regions of northern Europe. No great character had arisen in Sweden of exalted fame, neither king nor poet, nor philosopher, nor even singer. The little kingdom, to all appearance, was rich only in mines of iron and hills of snow. It was not till the middle of the sixteenth century that Sweden was even delivered from base dependence on Denmark. But Gustavus before he was thirty-five years of age had made his countrymen a nation of soldiers; had freed his kingdom from Danish, Russian, and Polish enemies; had made great improvements in the art of war, having introduced a new system of tactics never materially improved except by Frederic II. ; had reduced strategy to a science; had raised the importance of the infantry, had increased the strictness of military discipline, had trained up a band of able generals, and inspired his soldiers with unbounded enthusiasm. Nor amid the toils and dangers of war was Gustavus unmindful of his duties as a king. He was one of the most enlightened statesmen that had appeared since Charlemagne and Alfred. He established schools and colleges, founded libraries, reformed the codes of law, introduced wise mercantile regulations, rewarded eminent merit, respected the voice of experience, and developed the industries of the country. What Richelieu and Colbert did for France, what Burleigh and Cromwell did for England, Gustavus did for Sweden. His prime minister is illustrious for wisdom and ability, the celebrated Oxenstiern, through whose labors and genius the country felt no impoverishment from war. He laid the foundation of that prosperity which made a little kingdom great. But all his excellences as a general, a statesman, and a ruler paled before the exalted virtues of his private life. His urbanity, his gentleness, his modesty, his meekness, his simplicity, and his love won all hearts, and have never been exceeded except by Alfred the Great. He was a Saint Louis on a throne, in marked contrast with the suspicion, duplicity, roughness, and egotism of Oliver Cromwell,–the only other great man of the century who equalled Gustavus in the value of public services and enlightened mind. It is not often that Christian graces and virtues are developed amid the tumults of war. David lost nothing of his pious fervor and reliance on God when pursuing the Philistines, nor Marcus Aurelius when fighting barbarians on the frozen Danube. The perils and vicissitudes of war, with the momentous interests involved, made Lincoln shine, amid all his jokes, a firm believer in the overruling power that Napoleon failed to see. And so of Washington: he was a better man and firmer Christian from the responsibilities that were thrust upon him. Not so with Frederic the Great, and the marshals of Louis XIV., with the exception of Turenne: war seemed rather to develop their worst qualities. It usually makes a man unscrupulous, hard, and arrogant. Military life is anything but interesting in the usual bearing of Prussian officers. In our own Revolutionary war, generals developed pride and avarice and jealousy. War turned Tilly into a fiend. How cold and sullen and selfish it made Napoleon! How grasping and greedy it made Marlborough! How unscrupulous it made Clive and Hastings! How stubborn and proud it made Wellington! How vain and pompous it made Scott! How overbearing it made Belle-Isle and Villars! How reckless and hard it made Ney and Murat! The dangers and miseries of war develop sternness, hardness, and indifference to suffering. It is violence; and violence does not naturally produce the peaceful virtues. It produces courage, indeed, but physical rather than moral,–least of all, that spiritual courage which makes martyrs and saints. It makes boon companions, not friends. It gives exaggerated ideas of self-importance. It exalts the outward and material, not the spiritual and the real. The very tread of a military veteran is stately, proud, and conscious,–like that of a procession of cardinals, or of railway kings. So that when a man inured to camps and battles shines in the modest unconsciousness of a Christian gentleman or meditative sage, we feel unusual reverence for him. We feel that his soul is unpolluted, and that he is superior to ordinary temptations. And nothing in war develops the greatness of the higher qualities of heart and soul but the sacredness of a great cause. This takes a man out of himself, and binds his soul to God. He learns to feel that he is merely an instrument of Almighty power. It was the sacredness of a great cause that shed such a lustre on the character of Washington. How unimpressible the victories of Charlemagne, disconnected with that work of civilization which he was sent into the world to reconstruct! How devoid of interest and grandeur were the battles of Marston Moor and Worcester, without reference to those principles of religious liberty which warmed the soul of Cromwell! The conflicts of Bunker Hill and Princeton were insignificant when compared with the mighty array of forces at Blenheim or Austerlitz; but when associated with ideas of American independence, and the extension of American greatness from the Atlantic to the Pacific, their sublime results are impressed upon the mind with ever-increasing power. Even French soldiers have seldom been victorious unless inspired by ideas of liberty or patriotism. It is ever the majesty of a cause which makes not only great generals but good men. And it was the greatness of the cause with which Gustavus Adolphus was identified that gave to his character such moral beauty,–that same beauty which exalted William the Silent and William of Orange amid the disasters of their country, and made them eternally popular. After all, the permanent idols of popular idolatry are not the intellectually great, but the morally beautiful,–and all the more attractive when their moral excellence is in strong contrast with the prevailing vices of contemporaries. It was the moral greatness of Gustavus which has given to him his truest fame. Great was he as a military genius, but greater still as a benefactor of oppressed peoples. Surely it was no common hero who armed himself for the deliverance of Germany, which prostrate and bleeding held out her arms to be rescued from political degradation, and for the preservation of liberties dearer to good men than life itself. All Protestant Europe responded to the cry; for great interests were now at stake, not in Germany merely, but in the neighboring nations. It was to deliver his Lutheran brethren in danger of extermination, and to raise a barrier against the overwhelming power of Austria, that Gustavus Adolphus lent his armies to the Protestant princes of Germany. Other motives may have entered into his mind; his pride had been piqued by the refusal of the Emperor Ferdinand to acknowledge his title as King; his dignity was wounded by the contemptuous insolence shown to this ambassadors; his fears were excited that Austria might seek to deprive him of his throne. The imperial armies had already conquered Holstein and Jutland,–provinces that belonged to Sweden. Unless Austria were humbled, Sweden would be ruined. Gustavus embarked in the war against Austria, as William III. afterwards did against Louis XIV. Wars to preserve the “balance of power” have not generally been deemed offensive, when any power has become inordinately aggrandized. Pitt opposed Napoleon, to rescue Europe from universal monarchy. So Gustavus, deeply persuaded of the duties laid upon him, assembled together the deputies of his kingdom,–the representatives of the three estates,–and explained to them his intentions and motives. “I know,” said he, “the dangers I am about to encounter; I know that it is probable I shall never return; I feel convinced that my life will terminate on the field of battle. Let no one imagine that I am actuated by private feelings or fondness for war. My object is to set bounds to the increasing power of a dangerous empire before all resistance becomes impossible. Your children will not bless your memory if, instead of civil and religious freedom, you bequeath to them the superstitions of monks and the double tyranny of popes and emperors. We must prevent the subjugation of the Continent before we are reduced to depend upon a narrow sea as the only safeguard of our liberties; for it is delusion to suppose that a mighty empire will not be able to raise fleets, if once firmly established on the shores of the ocean.” Then taking his infant daughter Christiana in his arms, he recommended her to the protection of the nation, and bade adieu to the several orders of the State. Amid their tears and sobs, he invoked upon them and his enterprise the blessing of Almighty God. Then, hastening his preparations, he embarked his forces for the deliverance of Germany. It was on the 24th of June, 1630, just one hundred years after the confession of Augsburg, that Gustavus Adolphus landed on the German soil. 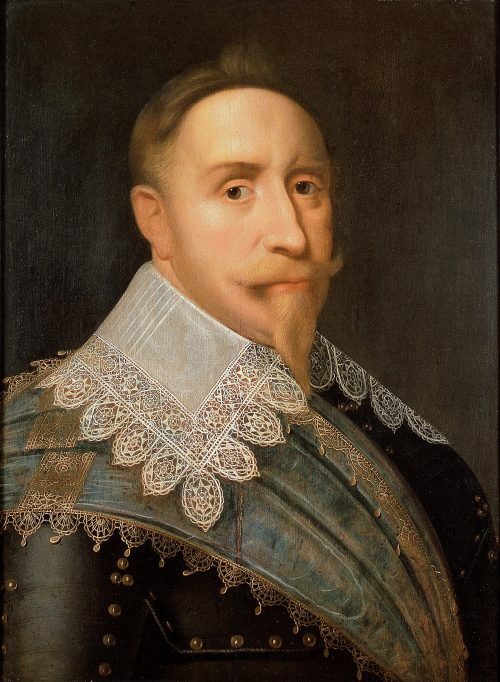 If ever the ruler of a nation is to be justified for going to war when his country is not actually invaded, it was doubtless Gustavus Adolphus. Had he withheld his aid, the probability is that all Germany would have succumbed to the Austrian emperor, and have been incorporated with his empire; and not only Germany, but Denmark and Sweden. The Protestant religion would have been suppressed in northern Germany, as it was in France by Louis XIV. There would have been no Protestant country in Europe, but England, and perhaps Holland. A united German Empire, with the restoration of the Catholic religion, would have been a most dangerous power,–much more so than at the present day. Some there are, doubtless, who would condemn Gustavus for the invasion of Germany, and think he ought to have stayed at home and let his unfortunate neighbors take care of themselves the best way they could. Perhaps the peace societies would take this ground, and the apostles of thrift and material prosperity. But I confess, when I see a man like the King of Sweden, with all the temptations of luxury and ease, encountering all sorts of perils and fatigues,–yea, offering up his life in battle in order to emancipate suffering humanity,–then every generous impulse and every dictate of enlightened reason urge me to add my praises with those of past generations in honor of such exalted heroism. I need not detail the various campaigns of the Swedish hero, his marchings and counter-marchings, his sieges and battles and victories, until the power of Austria was humbled and northern Germany was delivered. The history of all war is the same. There is no variety except to the eye of a military man. Military history is a dreary record of dangers, sufferings, mistakes, and crimes; occasionally it is relieved by brilliant feats of courage and genius, which create enthusiastic admiration, but generally it is monotonous. It has but little interest except to contemporaries. Who now reads the details of our last great war? Who has not almost forgotten the names of its ordinary generals? How sickening the description of the Crusades! The mind cannot dwell on the conflagrations, the massacres, the starvations, the desolations, of an invaded country. Few even read a description of the famous battles of the world, which decided the fate of nations. When battles and marches are actually taking place, and all is uncertainty, then there is a vivid curiosity to learn immediate results; but when wars are ended, we forget the intense excitements which we may have felt when they were taking place. We gaze with eager interest on a game of football, but when it is ended we care but little for the victors. It is only when the remote consequences of great wars are traced by philosophical historians, revealing the ways of Providence, retribution, and eternal justice, that interest is enkindled. No book to me is more dreary and uninteresting than the campaigns of Frederic II., though painted by the hand of one of the greatest masters of modern times. Even interest in the details of the battles of Napoleon is absorbed in the interest we feel in the man,–how he was driven hither and thither by the Providence he ignored, and made to point a moral to an immortal tale. All we care about the histories of wars is the general results, and the principles to be deduced as they bear on the cause of civilization. It was fortunate for the fame and the cause of Gustavus that at the very outset of his career, when he landed in Pomerania, with his small army of twenty thousand men, the Emperor had been prevailed upon by a pressure he could not resist, and the intrigues of all the German princes, to dispense with the services of Wallenstein. Spain, France, Bavaria,–the whole Electoral College, Catholic as well as Protestant,–clamored for the discharge of the most unscrupulous general of modern times. He was detested and feared by everybody. Humanity shed tears over his exactions and cruelties, while general fears were aroused that his influence was dangerous to the public peace. Most people supposed that the war was virtually ended, and that he was therefore no longer needed. Loath was Ferdinand to part with the man to whom he was indebted for the establishment of his throne; and it seems he was also personally attached to him. Long did he resist expostulations and threats. He felt as poor Ganganelli felt when called upon by the Bourbon courts of Europe to annul the charter of the Jesuits. Wallenstein would probably have been retained by Ferdinand, had this been possible; but the Emperor was forced to yield to overwhelming importunities. So the dismissal of the general was decreed at the diet of Worms, and a messenger of the Emperor delivered to the haughty victor the decree of his sovereign. Wallenstein was then at the head of one hundred thousand men. Would he obey the order? Would he retire to private life? Ambitious and unscrupulous as he was, he knew that no one, however powerful, could resist an authority universally conceded to be supreme and legitimate. It was like the recall of a proconsul by the Roman Emperor and Senate: he could resist for a time, but resistance meant ultimate ruin. He also knew that he would be recalled, for he was necessary to the Emperor. He anticipated the successes of Gustavus. He was not prepared to be a traitor. He would wait his time. So he resigned his command without a moment’s hesitation, and with apparent cheerfulness. He even loaded the messenger with costly gifts. He appeared happy to be relieved from labor and responsibility, and retired at once to his vast Bohemian estates to pursue his favorite studies in the science of the stars, to enshroud himself in mystery and gloom, and dazzle his countrymen by the splendor of his life. 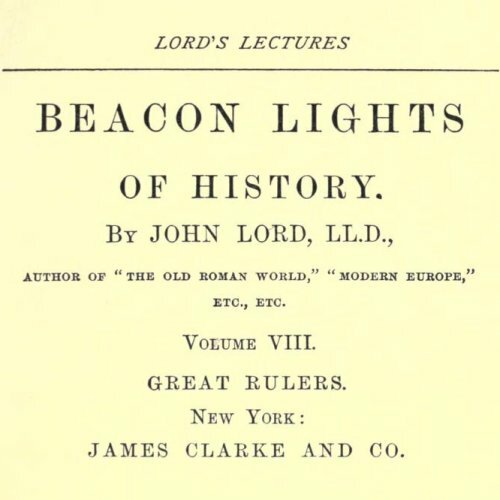 “His table was never furnished with less than one hundred covers; none but a noble of ancient family was intrusted with the office of superintending his household; an armed guard of fifty men waited in his antechamber; the ramparts of his castle were lined with sentinels; six barons and as many knights constantly attended on his person; sixty pages were trained and supported in his palace, which was decorated with all the wonders of art, and almost realized the fictions of Eastern luxury.” In this splendid retirement Wallenstein brooded on his wrongs, and waited for the future. The dismissal of this able general was a great mistake on the part of the Emperor. There were left no generals capable of opposing Gustavus. The supreme command had devolved on Tilly, able but bigoted, and best known for his remorseless cruelty when Magdeburg was taken by assault,–the direst tragedy of the war. This city was one of the first to welcome the invasion of the King of Sweden, and also to adopt the Protestant religion. It was the most prosperous city in northern Germany; one of the richest and most populous. Against this mercantile fortress Tilly directed all his energies, for he detested the spirit of its people. It was closely invested by the imperial troops, and fell before Gustavus could advance to relieve it. It was neglected by the electors of Saxony and Brandenburg, who were timid and pusillanimous, and it was lulled into false security by its strong position and defences. Not sufficient preparation for defence had been made by the citizens, who trusted to its strong walls, and knew that Gustavus was advancing to relieve it. But unexpectedly it was assaulted in the most daring and desperate manner, and all was lost. On a Sabbath morning, the sudden toll of alarm bells, the roar of artillery, the roll of drums beating to quarter, and the piercing cries of women and children, mingled with the shouts and execrations of brutal and victorious soldiers, announced the fate of Magdeburg. Forty thousand people–men, women, and children–were inhumanly butchered, without necessity, quarter, compassion, or remorse. So cold and hard is war! This was the saddest massacre in the history of Germany, and one of the greatest crimes that a successful general ever committed. History has no language, and painting no colors to depict the horrors of that dreadful scene; and the interval of more than two hundred years has not weakened the impression of its horrors. The sack of Magdeburg stands out in the annals of war like the siege of Tyre and the fall of Jerusalem. But it roused the Protestants as from a trance. It united them, as the massacre of St. Bartholomew united the Huguenots. They marched under the standard of Gustavus with the same enthusiasm that the Huguenots showed under Henry IV. at the battle of Ivry. There was now no limit to the successes of the heroic Swede. The decisive battle of Leipsic, the passage of the Lech, the defence of Nuremberg, and the great final victory at Lutzen raised the military fame of Gustavus to a height unknown since Hannibal led his armies over the Alps, or Caesar encountered the patrician hosts at the battle of Pharsalia. No victories were ever more brilliant than his; and they not only gave him a deathless fame, but broke forever the Austrian fetters. His reputation as a general was fairly earned. He ranks with Condé, Henry IV., Frederic the Great, Marlborough, and Wellington; not, perhaps, with Alexander, Caesar, and Napoleon,–those phenomena of military genius, the exalted trio who shine amid the glories of the battlefield, as Homer, Dante, and Shakspeare loom up in fame above other immortal poets. In two years from the landing of Gustavus Adolphus on the island of Ruden, near the southern extremity of the Baltic, he expelled a triumphant enemy from Pomerania, traversed the banks of the Oder, overran the Duchy of Mecklenburg, ascended the Elbe, delivered Saxony from the armies of Tilly, crossed the Thuringian forest, entered Frankfort in triumph, restored the Palatinate to its lawful sovereign, took possession of some of the strongest fortresses on the Rhine, overran Bavaria, occupied its capital, crossed the Danube, and then returned to Saxony, to offer up his life on the plains of Lutzen. There, on that memorable battlefield, where the descending sun of victory in later times shed a delusive gleam on the eagles of Napoleon before his irremediable ruin, did Gustavus encounter the great antagonist of German liberties, whom the necessities of the Emperor had summoned from retirement. Wallenstein once more commanded the imperial armies, but only on conditions which made him virtually independent of his master. He was generalissimo, with almost unlimited authority, so long as the war should last; and the Emperor agreed to remove neither the general himself nor his officers, and gave him principalities and spoils indefinitely. He was the most powerful subject in Europe, and the greatest general next to Gustavus. I read of no French or English general who has been armed with such authority. Cromwell and Napoleon took it; it was not conferred by legitimate and supreme power. Had Wallenstein been successful to the end, he might have grasped the imperial sceptre. Had Gustavus lived, he might have been the dictator of Germany. The death of Gustavus Adolphus in the hour of victory was a shock which came upon the allies like the loss of the dearest friend. The victory seemed too dearly purchased. The greatest protector which Protestantism ever knew had perished, as he himself predicted. Pappenheim, the bravest of the Austrian generals, also perished; and with him, the flower of Wallenstein’s army. Schiller thinks that Gustavus died fortunately for his fame; that had he survived the decisive battle of Lutzen, he not only could have dictated terms to the Emperor, but might have yielded to the almost irresistible temptation of giving laws to the countries he had emancipated. But he did not live to be tried. That rarest of all trials was reserved alone for our Washington to pass through triumphantly,–to set an example to all countries and ages of the superiority of moral to intellectual excellence. Gustavus might have triumphed like Washington, and he might have yielded like Cromwell. We do not know. This only we know,–that he was not merely the great hero of the Thirty Years’ War, but one of the best men who ever wore a crown; that he conferred on the Protestants and on civilization an immortal and inestimable service, and that he is to be regarded as one of the great benefactors of the world. The Thirty Years’ War loses its dramatic interest after the battle of Lutzen. The final issue was settled, although the war was carried on sixteen years longer. It was not till 1648 that the peace of Westphalia was signed, which guaranteed the liberties of Germany, and established the balance of power. That famous treaty has also been made the foundation of all subsequent treaties between the European nations, and created an era in modern history. It took place after the death of Richelieu, when Mazarin ruled France in the name of Louis XIV., and when Charles I. was in the hands of Cromwell. With the death of Gustavus we also partially lose sight of Wallenstein. He never afterwards gained victories commensurate with his reputation. He remained, after the battle of Lutzen, unaccountably inactive in Bohemia. But if his military fame was tarnished, his pride and power remained. His military exactions became unendurable, and it is probable he was a traitor. So unpopular did he become, and so suspicious was the Emperor, who lost confidence in him, that he was assassinated by the order of his sovereign. He was too formidable to be removed in any other way. He probably deserved his fate. Although it was difficult to bring this great culprit to justice, yet his death is a lesson to traitors. “There are many ways,” said Cicero, “in which a man may die,”–referring to the august usurper of the Roman world. I will not dwell on the sixteen remaining years of the Thirty Years’ War. It is too horrible a picture to paint. The desolation and misery which overwhelmed Germany were most frightful and revolting. The war was carried on without system or genius. “Expeditions were undertaken apparently with no other view than to desolate hostile provinces, till in the end provisions and winter quarters formed the principal object of the summer campaigns.” “Disease, famine, and want of discipline swept away whole armies before they had seen an enemy.” Soldiers deserted the ranks, and became roving banditti. Law and justice entirely vanished from the land. Germany, it is asserted by Mitchell, lost probably twelve millions of people. Before the war, the population was sixteen millions; at the close of the war, it had dwindled to four millions. The city of Augsburg at one time had eighty thousand inhabitants; at the close of the war, it had only eighteen thousand. “No less than thirty thousand villages and hamlets were destroyed. Peaceful peasants were hunted for mere sport, like the beasts of the forest. Citizens were nailed up and fired at like targets. Women were collected into bands, driven like slaves into camp, and exposed to indignities worse than death. The fields were allowed to run waste, and forests sprung up and covered entire districts which before the war had been under full cultivation.” Amid these scenes of misery and ruin, vices were more marked than calamities. They were carried to the utmost pitch of vulgarity. Both Austrian and Swedish generals were often so much intoxicated, for days together, as to be incapable of service. Never was a war attended by so many horrors. Never was crime more general and disgusting. So terrible were the desolations, that it took Germany one hundred years to recover from her losses. It never recovered the morality and religion which existed in the time of Luther. That war retarded civilization in all the countries where it raged. It was a moral and physical conflagration. But there is a God in this world, and the evils were overruled. It is certain that Protestantism was rescued from extermination on the continent of Europe. It is clear also that a barrier was erected against the aggressions of Austria. The Catholic and the Protestant religions were left unmolested in the countries where they prevailed, and all religious sects were tolerated. Religious toleration, since the Thirty Years’ War, has been the boast and glory of Germany. We should feel a sickening melancholy if something for the ultimate good of the world were not to come from such disasters as filled Germany with grief and indignation for a whole generation; for the immediate effects of the Thirty Years’ War were more disastrous than those of any war I have read of in the history of Europe since the fall of the Roman Empire. In the civil wars of France and England, cities and villages were generally spared. Civilization in those countries has scarcely ever been retarded for more than a generation; but it was put back in Germany for a century. Yet the enormous sacrifice of life and property would seem to show the high value which Providence places on the great rights of mankind, in comparison with material prosperity or the lives of men. What is spiritual is permanent; what is material is transient. The early history of Christianity is the history of martyrdom. Five millions of Crusaders perished, that Europe might learn liberality of mind. It took one hundred years of contention and two revolutions to secure religious toleration in England. France passed through awful political hurricanes, in order that feudal injustice might be removed. In like manner, twelve millions of people perished in Germany, that despotism might be rebuked. Fain would we believe that what little was gained proved a savor of life unto life; that seeds of progress were planted in that unhappy country which after a lapse of one hundred years would germinate and develop a higher civilization. What a great Protestant power has arisen in northern Germany to awe and keep in check not Catholicism merely, but such a hyperborean giant as Russia in its daring encroachments. But for Prussia, Russia might have extended her conquests to the south as well as to the west. But for the Thirty Years’ War, no such empire as Prussia would have been probable, or perhaps possible. But for that dreadful contest, there might have been to-day only the Catholic religion among the descendants of the Teutonic barbarians on the continent of Europe. But for that war, the Austrian Empire might have retained a political ascendency in Europe until the French Revolution; and such countries as Sweden and Denmark might have been absorbed in it, as well as Saxony, Brandenburg, and Hanover. What a terrible thing for Germany would have been the unbroken and iron despotism of Austria, extending its Briarean arms into every corner of Europe where the German language is spoken! 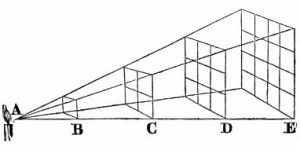 What a blow such a despotism would have been to science, literature, and philosophy! 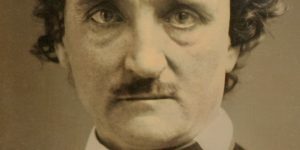 Would Catholic Austria, supreme in Germany, have established schools, or rewarded literary men? The Jesuits would have flourished and triumphed from Pomerania to Wallachia; from the Baltic to the Danube. It may have taken one hundred years for Germany to rally after such miseries and disasters as I have had time only to allude to, and not fully to describe; but see how gloriously that country has at last arisen above all misfortunes! Why may we not predict a noble future for so brave and honest a people,–the true descendants of those Teutonic conquerers to whom God gave, nearly two thousand years ago, the possessions and the lands of the ancient races who had not what the Germans had,–a soul; the soul which hopes, and the soul which conquers? The Thirty Years’ War proved that liberty is not a dream, nor truth a defeated power. Liberty cannot be extinguished among such peoples, though “oceans may overwhelm it and mountains may press it down.” It is the boon of one hundred generations, the water of life distilled from the tears of unnumbered millions,–the precious legacy of heroes and martyrs, who in different nations and in different ages, inspired by the contemplation of its sublime reality, counted not their lives dear unto them, if by the sacrifice of life this priceless blessing could be transmitted to posterity. Hallenberg’s History of Gustavus Adolphus; Fryxell’s History of Sweden, translated by Mary Howitt; Dreysen’s Life of Gustavus Adolphus; S.R. Gardiner’s Thirty Years’ War; Schiller’s Thirty Years’ War; Schiller’s Wallenstein, translated by Coleridge; Dr. Foster’s Life of Wallenstein; Colonel Mitchell’s Life of Gustavus Adolphus; Lord F. Egerton’s Life and Letters of Wallenstein; Chapman’s History of Gustavus Adolphus; Biographie Universelle; Article in Encyclopaedia Britannica on Sweden; R.C. Trench’s Social Aspects of the Thirty Years’ War; Heydenreich’s Life of Gustavus Adolphus.